Back in 2003, the part of Auckland where Maloney’s BarberShop sits was a nondescript light industrial area. 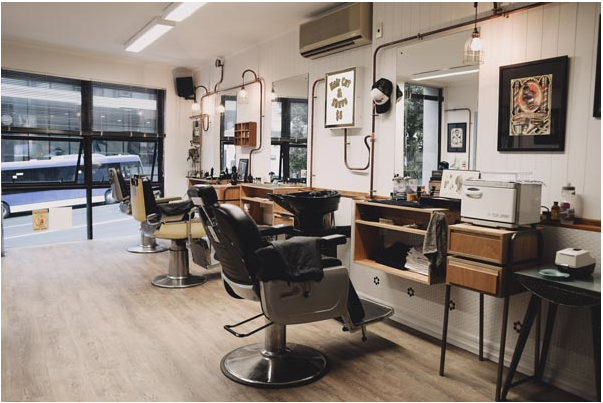 But, it was just five minutes’ walk from the iconic Sky Tower and close to owner Julian Maloney’s old stomping ground of Ponsonby, where he had built up a large clientele barbering for the previous eight years. The gamble paid off – now the area’s been revamped and is pumping with eateries, breweries, apartments and offices – enough to keep the shop busy six days a week. Over the past 12 years Maloney’s has grown from small beginnings as a one barber/two chair shop, to its current size of eight chairs, two cutting levels and a staff of ten, including apprentice Cole. Julian started his hairdressing apprenticeship in 1987 and discovered a love of barbering while on his OE in the UK in 1992, where he worked with second generation Sicilian barbers in Oxford. Back then those guys were doing much the same as barbers today: detailed hair art, skin fades and straight razor shaves. Maloney’s offers classic barber cuts, restyles, longer cuts and hot towel shaves, plus ever more beard trims and shaping. Julian’s worked to attract a team of like-minded barbers, all who genuinely love their trade whilst keeping their loyal clients centre stage. Recently they’ve found that great barbers tend to come to work in the shop through word of mouth, recommendation or social media, rather than traditional job adverts. Julian says, “All the barbers at Maloney’s use Instagram, Facebook and other social media to follow barber shops around the world as well as showing off their haircuts, techniques and unique Kiwi style of barbering. They’re outwards looking and like to keep current.” This is reflected in the hair products they use and sell, many of which they import from overseas, including Suavecito, Bona Fide and Layrite – often on the recommendation of their barbers, who could be described as pomade addicts. The team also compares notes on the latest gear and garb, importing equipment in bulk from the USA (the most recent craze is Wah 5-star foils). The team’s got a good world view and includes barbers from England, Scotland and Canada, as well as locals with Samoan, Maori and Pakeha heritage. Some have come from a hairdressing background and some have been barbers from the start; and there a couple of women (Barber Sue and Cutthroat Sue!) to make it the perfectly balanced barbershop. They’re keen on pursuing exchanges with overseas barber shops too (Jordan from Melbourne’s Royal Crown Barbers spent a couple of days there at Christmas). It’s important for Maloney’s to be involved in the local and wider community. Recently they’ve supported a wide range of community groups, including: Auckland City Football Club (whose cuts from Maloney’s helped them reach third place at the FIFA World Club Cup); their local swing dancing group; Movember (which saw All Blacks legend Richie McCaw being filmed having a shave in the shop), a chopper show and the Ponsonby gay community’s “Bear Week”. Maloney’s prides itself on consistently high standards for good value, and is striving to raise the bar for barbering in NZ. Here, you can enter the industry via a private provider (hairdressing or barber school), or the more traditional apprenticeship system (either ladies’ hairdressing or, since 2007, barbering), but surprisingly not many Kiwi barbers choose to take their training to National Certificate level. Maloney’s is aiming to set an example of how straightforward this process can be; by the end of the year the whole team will have completed their National Certificate in Barbering. They’re also planning further involvement with HITO to raise the industry standards and recognition and bring in formal barbering competitions. “The barbering industry has never been so vibrant or popular and is attracting really creative people whom we need to support and grow,” says Julian.